Welcome to the blog! this is a place to share any of your BBD cross-stitch or quilting projects! Wow, that's really a lot! Nice stockings, neat finishing! Oh my gosh! They are just adorable! I am so impressed with your speed and finishing skills! I am stitching feverishly on mine, but won't finish in time to enjoy them this year. Wonderful stitching, as always, Wakana! WOW!!! What an inspiration. They are FABULOUS! Those are darling! You did a fantastic job! Your stockings are delightful! I'm interested in your display tree, too -- is it something you ordered online? Wow, these are gorgeous! Sometimes the photos on the cover of the charts/books don't do the pieces justice. Congrats on your finish! I'm also wondering about your ornament tree. I've been looking for something similar for the last year or so with no luck. My goodness...those are too cute! Great job on your finishes and finishing. thank you all so much for your kind comments - what a great way to start a day :-) the ornament tree is my husband's garage sale find a couple of years ago. 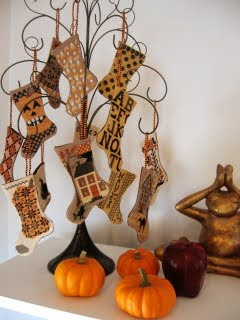 Sorry i don't know where it came from before that... but it's a perfect size tree for these stockings. Your stockings look beautiful and are finished beautifully. I have this book and you have inspired me to do mine. They look so cute on that tree. Oh my..what a beautiful display. Wish I had seen it sooner! Congratulations on your stockings they look great. They turned out great. What a fast stitch. Very nice. O.k. I am so jealous of this tree it is so beautiful. I have the same book and hope to have them done for next Halloween. You got these done so fast, and they look wonderful, thanks for the inspiration! you can find some of us here too! This is a Flickr badge showing public items from the blackbird cross stitching designs group pool. Make your own badge here.